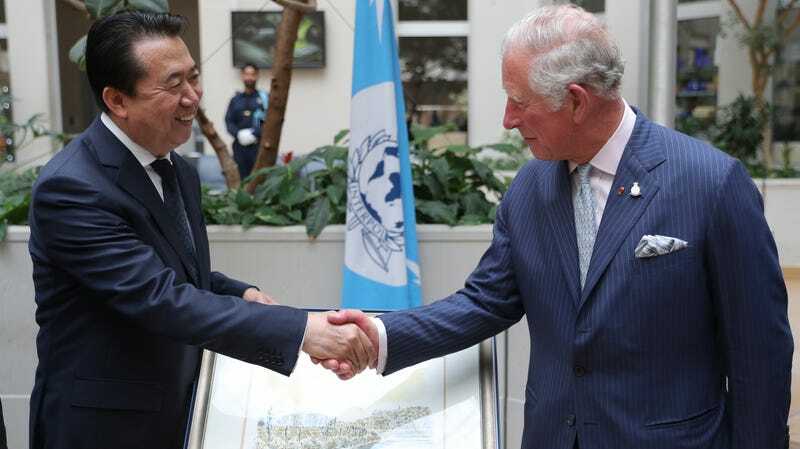 LYON, FRANCE - MAY 07: The Prince of Wales shakes hands with Interpol President Meng Hongwei during his tour of Interpol as part of his visit to France on May 8th, 2018 in Lyon, France. Now-former Interpol head Meng Hongwei was reported missing by his wife, Grace, last week, claiming she hadn’t heard from her husband in 10 days while he was visiting China, according to the French Interior Ministry. On Sunday, Grace told reporters at a press conference in Lyon that the last message she received from her husband was a knife emoji, which she believed was him signaling to her that he was in danger. The Chinese government confirmed this weekend that Meng is being detained in China, his native country. China’s anti-corruption unit is investigating the Interpol head for “alleged violations of the law,” which included suspicions of “accepting bribes,” authorities said. The Chinese government reportedly made its statement closely after Grace revealed her husband had sent her his ominous last message. Interpol, the international police agency, stated that it received Meng’s resignation “with immediate effect” late Sunday night, according to the Guardian. Grace said at the press conference that her husband sent her the knife emoji in a WhatsApp message on his work phone along with the text, “Wait for my call,” four minutes later. He never called, and she said they haven’t spoken since. She also said that they had been in touch daily while Meng was traveling. Grace had sent her husband an image of a bear and a horse figurine—she said they reminded her of their kids—before he sent her the knife emoji and message. That was on September 25.